Periodically we all need to recapture our youth and idealism, especially at a moment when America was mired in a malaise that President Jimmy Carter called a "crisis of confidence." Jerry Siegel and Joe Shuster understood that when they introduced their hero in the midst of the Depression and on the eve of a world war. The Salkinds understood it when the bought the rights to Superman and hired two grown-up kids -- Donner and Makiewicz -- to make the movie. That snippet comes from the chapter talking about specifically about the first Christopher Reeve movie, a movie I saw in the theater as a kid when it first came out. I, of course, already knew Superman from the comics and the Super Friends cartoon and I think I had already seen some of the George Reeves shows in syndication. But in Reeve, I totally bought into how Reeve transformed from Clark Kent to Superman and made it totally believable. And with the effects (and a six-year-old's brain) I really did believe a man could fly. My childhood in the 1970s was, by and large, enjoyable. We had a tree house in the backyard, we could bike over to the playground at the school a half mile up the road, we had our Mego (and later Star Wars) action figures, and there were some brilliantly wacky shows on TV like H.R. Pufnstuf and The Hot Fudge Show. But I also recall a good portion of the decade tinged with a pervasive shadow of pessimism. At the time, I of course had little to no grasp on the recession, stagflation, Vietnam, Watergate, or any of the other events that seemed to beat to death whatever optimism people might've had in the 1960s. But the feelings they brought forth in adults were palpable. My impressions of the 1970s are naturally skewed a bit by my young age at the time, but I look back on the decade as one where society as a whole was miserable and grasped at anything they could that provided any sort of light or hope. Which is where we got crazy things like Pufnstuff. I think that led, in part, to the enormous success of Star Wars -- a simple premise of good versus evil that spoke directly to a great escapist fantasy. And that led to the Reeve Superman. The movie is so filled with hope and optimism about a savior for mankind that we desperately needed right at that moment. "You've got me? Who's got you?!?" doesn't need to be answered because it doesn't matter -- somebody needed to be there to rescue us at the last minute as we fell and there he was in blue spandex. We didn't care HOW we got saved, just that we were. And Superman was there at just the right time, with just the right casual smile, with just the right sense of comfortable confidence, with just the right set of simple answers. "Easy, miss. I've got you," was all we really needed. You heard about Mike Meyer's story late last year, didn't you? He was the Superman fan who had a good chunk of his collection stolen. I heard a follow-up recently on State of the Re:Union about how much had been collected and sent to him, even after his stolen collection was retrieved. 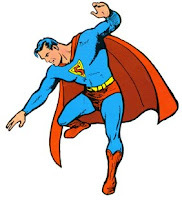 At Superman Celebration a couple weeks ago, Meyer noted that he'd also gotten a personal call from Brandon Routh, visited the set of Man of Steel to meet Henry Cavill and Amy Adams, and was able to draw his own Superman on Jerry Siegel's writing desk in the Cleveland home where Siegel grew up. It's an incredibly touching story, made all the more powerful by such heart-warming ending. All because of Superman. Superman is indeed a powerful character that, when done well, touches on exactly what we need in times of desperation. He is hope and optimism and idealism and peace and unconditional love and inspiration and personal conviction and inner strength and all the things that humanity should be striving for. I can completely see why so many people gravitate towards the character. But that quote I started with stands out because that's where we are today in 2012. That's where we've been since 2007, and one of the reasons why Obama's message of hope and change helped get him into office. But he's not Superman, despite some of the visual analogies made to that effect. 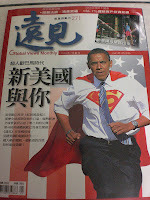 And because Obama is not Superman, we still need Superman. And I think that's where DC and Time-Warner have faltered. I don't see the Superman we need anywhere right now. The Brandon Routh movie was a tad too early, and was perhaps a little too grounded with the subplots to become really good escapism. Same with Smallville. I think the same holds for what's in the comics -- interacting with a darker hero like Batman dampens the optimism people respond to when they latch onto Superman and doesn't get free enough to be pure escapism. I can't speak directly to the cartoons, but I get the sense those are in the same vein as the comics. Will the Cavill version be the version we need? Maybe, maybe not. I don't know. Personally, I'm getting more of a Kirk Alyn vibe from him, and I don't think that would go over as well, but it's obviously too early to say for sure. But we're at one of those dark times when our culture needs a hero with a casual smile, a wink and a nod, and the power and confidence to handle any problem that gets thrown at him. We've got enough struggles; we need to see someone who we know can rise above them all. Siegel and Shuster saw that in the 1930s. Richard Donner saw that in the 1970s. Despite the catchphrase, Superman's not out fighting for truth, justice and the American Way. He's there to fight for a brighter future when it looks like we don't have one. Superman is the light at the end of the tunnel. And right now, I think we need that Superman; we've been in this darkness for too long. I think it will be hard for Superman to score an inspirational hat-trick at this point, given the context working against any new Superman project feeling in any way special. Since I was a teenager we've had two prime-time Superman television series, plus one feature film "comeback" which kind of fell into an awkward, so-so space between flop and mega-hit. Now there's another instance of "rebooting the franchise" in the works. Meanwhile, the past decade has also seen superhero "franchises" become a steady fixture of movie fare. And the way that pretty much all of them are being quite nakedly pushed as "product franchises" driven by commercial gain first and magic & wonder second, if at all, seems guaranteed to pre-define any new Superman revival as "more of the same." I just don't think Superman can save us this time. And arguably there's a very good story, here. I kind of imagine a very realistic Elseworlds where the world is troubled but not by mad scientists, alien invasions or giant monsters. Would Superman see any use for himself when the problems we need saving from are largely immune to his powers, e.g. economic stagnation, widening inequality, environmental degradation, and most of all political intransigence? Not entirely new territory, but could be a very deep story. Unfortunately (at least as I imagine it playing out) it probably would not prove any more of an inspiration to pessimistic times than will Superman VII (or whatever it works out as). I think that a creator CAN get to the magic and wonder despite origins in the product franchise arena. Whedon gets really close in Avengers, and only just misses the mark due the insane level of franchiseness that went into the movie since around 2007 when Robert Downey Jr was first cast as Iron Man. If that same creative approach were taken with Superman (not necessarily the same story, obviously, just the basic idea of telling a decent story and making it fun) the character could conceivably re-capture that lightning. But, as you say, that would be very hard to pull off in today's context. All the more reason we need him. A Superman post, so I think I have to chime in. I don't think Superman a Superman story needs a great story--just not a terrible one. The one ingredient it has to have to succeed is Superman inspiring other people. Superman Returns didn't have that at all. he demonstrated his powers, and awed people, but we didn't get to see anyone trying to live up to the example he set. Show him inspiring people by his actions. He cares about people, and he's willing to help with even the smallest of troubles. Get that in the movie and it's going to work.